Great powers invariably disguise foreign interference or military intervention as a humanitarian mission. The refrain may vary but in fact always comes down to the same thing: out of concern for the local population we have no other choice than to intervene. In Iraq democracy had to be restored, in Libya it was a massacre the population had to be saved from and in Syria the refrain was that of human rights and democracy that had to be defended. After the foreign interference, the three countries were completely destroyed or left behind in chaos. “President Trump stands with the people of Venezuela as they demand democracy, human rights, and prosperity denied to them by Maduro,” according to the White House. Let’s check. Had Trump been so concerned about democracy, why did he congratulate Juan Orlando Hernández on his election victory in Honduras in December 2017? To friend and foe it was clear that those presidential elections were one big farce. And what about human rights? If Trump really considers them so important, why does he not immediately impose economic sanctions on Colombia, Venezuela’s neighbour? Since the signing of the peace agreement in 2016, more than 300 community leaders, trade unionists and human rights activists have been murdered there. That is much more than in Venezuela during the same period. In Venezuela, by the way, the deadly victims feel as a result of the unrest triggered by the opposition. It is illuminating to note that Trump has so far consistently championed freedom and democracy in only three countries altogether: Cuba, Iran and Venezuela. Alfred de Zayas, former head of the UN Human Rights Council, exposes the humanitarian rhetoric. Venezuela has the largest oil reserves in the world. Potentially, depending on the oil price, annual oil revenues amount to at least 50 to 100 billion dollars. It is this bonanza that the energy giants of the US have their eye on. John Bolton, is at their beck and call. Foreign policy at the service of multinationals, you cannot put it more clearly. In 2015, the US launched economic sanctions against Venezuela. These sanctions disrupt financial transactions, freeze assets abroad and hamper the import of food, medicines and other basic necessities. It is well possible to question Maduro’s economic policy, but in any case, the sanctions have not missed their effect. Since their launch, the social situation has deteriorated significantly. Child mortality and malnutrition have increased. Venezuela plunged down 16 places in the overall global Human Development Index rankings of the UNDP. Many people are leaving the country as a result of this decline. De Zayas, quoted above, was UN rapporteur for Venezuela at the time. He wrote a report on the consequences of the sanctions. He unquestionably labels them as a crime against humanity. In Venezuela’s current approach, three men play a leading role: Trump, Bolton and Abrams. And then we have Trump. He has his own reasons for a regime change in Venezuela. His foreign policy has so far been quite catastrophic. He has lost a lot of influence in the Middle East at the expense of Russia. He has also been unable to present results in the conflicts with Iran and North Korea. Perhaps Venezuela can offer him a long-awaited victory. A large part of the Venezuelan elite has left the country. Many moved to Florida and bought condo units in Trump properties. 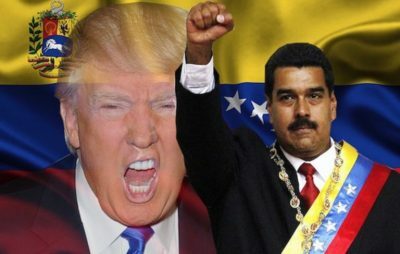 Financial Times writes that “it is impossible to draw a line between Mr Trump’s business ties and his support for democracy in Venezuela”. Nor should we forget that Florida is an important swing state. A hard stance towards Maduro can give Trump the votes of the increasing number of Venezuelans who have settled there and may thus make sure that the state tilts to his advantage. The fact that the foreign policy of the United States is determined by not very noble motives is not new and should not really come as a surprise. But the fact that Canada and the EU are getting dragged down by these three worrying fellows makes it all the more painful.